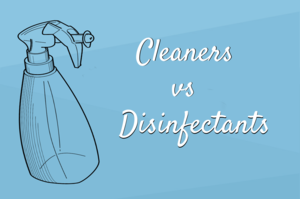 Cleaners Vs. Disinfectants - What Do You Need To Know? » Cleaners Vs. Disinfectants – What Do You Need To Know? Now, while cleaning is good, it is always a smart idea to disinfect your home on a regular basis. Cleaners in Smyrna know the difference between ordinary clean and sterilized a home. They will make sure they use the right products according to your requirements and needs. In case you were wondering there are a few main differences between a deep clean and a professional disinfection. Cleaners eliminate superficial dirt and germs off surfaces. Whereas, sanitizers deep clean to remove all harmful organisms and make the area sanitary clean. Disinfectants are stronger than ordinary household cleaners as they have a formula that contains ingredients meant specifically for the removal of germs and other disease-causing organisms. So the question here is not whether to choose to clean or disinfect, but what order should you follow. Remember, to ensure healthy living space to yourself and your loved ones clean first and disinfect second. Or trust cleaners in Smyrna, they use high-quality sterilizers to make sure all areas in your home are properly sanitized. Many people believe that disinfectants are harmful due to the presence of chemicals. This may have been true many years ago but nowadays, safer and milder formulas are being used to create these products. You should always look for EPA (Environmental Protection Agency) approved products to make sure you are using safe and eco-friendly cleansers. The market is also filled with products made of 100% natural ingredients. If you prefer these, you should know they are just as effective as other solvents and do our environment world of good. Cleaning your home is important as it helps create a healthy environment for everyone. Our cleaning services specialists can help you have a spotless home that looks immaculate from top to bottom. If your home requires sanitation, they will make sure the job is done. Remember to disinfect your home regularly, keeping harmful germs and bacteria away and creating a safe place for everyone you love!